Indian prince and mystic. Also known as Sâkyamuni and Gautama, the Buddha. The founder of the religion of Buddhism. Crowley considered him to be a Magus of A:. A:., whose Word was ANATTA, literally “No Soul,” or “No Ego,” with “Soul” or “Ego” referring to a changeless substance. See Chapter 70 of Liber Aleph, Part III of The Heart of the Master, and Chapter 7 of The Book of Lies. Born a wealthy Hindu prince in the north-east of India, Siddhârtha was brought up in the ease of the court and shielded from the sufferings of the world. One day, jaded by court life, he decided to secretly visit the local town. Upon leaving the shelter of home, his sudden exposure to old age, poverty, disease and death was a complete shock to him, and he was deeply disturbed. Upon returning to the palace, he began to reassess all his beliefs and values, including the Hinduism of his childhood. He continued to recall one particular incident from his journey to the town: he had encountered a begging ascetic, who informed him that he had renounced the world to pass beyond joy and suffering, and had thereby obtained peace. Siddhârtha resolved to become an ascetic himself. He stole away from his father’s palace, leaving his young wife Yasôdhara and his infant son Rahula behind, and made his way to a hermitage where he was received by the Brâhmanas as a disciple. He changed his name to Gautama, and spent years engaged in austere ascetic practices. But he remained troubled. He moved from hermitage to hermitage, hoping to find peace and understanding, but finding only more suffering. Finally, half dead, he sat down beneath a Bo (Pipal) tree and swore to himself that he would not arise until he had attained the knowledge he desired. Though tempted all day by the demon Mâra and his voluptuous daughters, he remained unmoved in the fixity of his contemplation on human suffering. As night fell, enlightenment came to him; and by daybreak the next day, he had obtained perfect knowledge of his own past lives, the condition of all living beings, the nature of suffering and the way to destroy it. He remained beneath the Bodhi Tree for seven more days, then arose and began to preach a new religion. Siddhârtha never set his teachings down in writing, and Buddhism has no single holy book. Instead, its basic tenets are set forth in a large canon of essays, dialogues, poems and tractates, most of which were written 600-900 years after Siddhârtha’s death. Two of these, The Dhammapada, a collection of the sayings of the Buddha, and The Questions of King Milinda, a primer of Buddhist doctrine in dialogue form, are included in the Liber E and A:. A:. Section 1 reading lists. 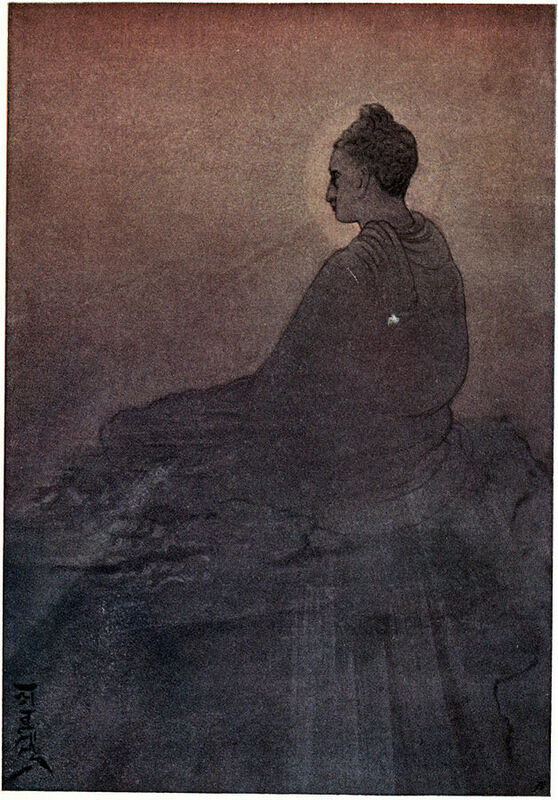 In 1879, Sir Edwin Arnold composed a book-length poem on the life and teachings of Siddhârtha called The Light of Asia, which is included in Section 2 of the A:. A:. reading list. The fundamental doctrine of primitive Buddhism is that all suffering is caused by the desire for pleasure. To escape suffering, one must extinguish all desire. The method of annihilating desire is to avoid the extremes of pleasure-seeking and self-maceration, and to living a simple life of lucidity, moderation and charity. “Existence is Sorrow.” All is transitory. “Sorrow’s Cause.” The cause of sorrow is desire. “Sorrow’s End.” The end of desire is the end of sorrow. “The Noble Eightfold Path.” The way to Nirvâna, which is the end of desire and sorrow. Not to indulge in intoxicants which cloud the mind. The Buddha himself: as an example of achievement. The Dharma: the truth of the Teaching. The Sangha: the Buddhist community – the efforts of others. Theravâda (also called Hînayâna) Buddhism: This represents the original Monastic Buddhism, and is prevalent in Sri Lanka, Burma, Laos, Thailand and Cambodia. Mahâyâna Buddhism: This represents “Evangelical” Buddhism, and includes Zen and the other forms of Chinese, Japanese and Korean Buddhist systems. Vajrayâna Buddhism: This represents “Magical” Buddhism, and is exclusive to the Tibetan Buddhist systems, now practiced primarily in Bhutan and Northern India. Buddhism, along with its twin sister Jainism, exerted considerable influence on later Hinduism, and may have influenced the teachings of Apollonius of Tyana and the Gnostics. It certainly influenced the philosophy of Pessimism of Arthur Schopenhauer (1788-1860 e.v.) which in turn influenced the thought of Friedrich Nietzsche and Richard Wagner.